Superior quality hair interlining used for suits. 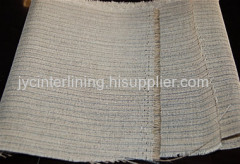 Hair Interlining Cloth is made with pure cotton yarn, polyester yarn or cotton-polyester yarn as warp while blend of yak hair, goats hair and human hair as weft. Yak hair and goats hair offers good spring and good resistance to twisting or wrinkling. Yak hair is softer and more flexible compared with horse tail hair by-products, but has less spring and straightness after being dressed and shaped. Other properties are similar with horsetail hair lining fabrics. Hair Interlining Fabric enjoys a broad range of application, can be used together with horsetail hair lining fabrics or other lining fabrics. 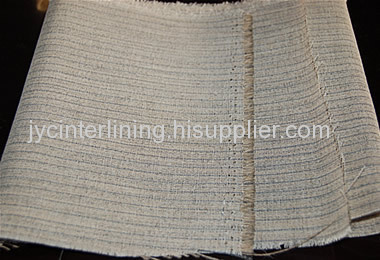 As a specialized manufacture for garment accessory ,(hair interlining,nonwoven inerling,complex inerlinning,under collar felt and so on)in China.We can supply good quality and competitive price. hair interlining cloth has been presented above, want more similar products, please click body canvas interlining.